Evaluates long-term trends in river water quality assessments: This monitoring program maintains a continuous series of data for the major rivers in Rhode Island, allowing managers to track trends over time. Tracks and determines pollutant loadings from rivers into Narragansett Bay: Knowing the amount of pollutants that are being discharged into the bay from its major tributaries is essential to managing the water quality of Narragansett Bay. Informs discharge permit limits and water quality modeling: Monitoring the current water quality status of our rivers helps us to understand the impact of current discharges, and predict and manage the impacts of future discharges. Most of Rhode Island’s streams, ponds, and lakes drain into three major rivers: the Blackstone, the Pawtuxet, and the Pawcatuck. The Blackstone and Pawtuxet Rivers flow into Narragansett Bay, while the Pawcatuck River flows into Little Narragansett Bay and then on to the Atlantic Ocean. 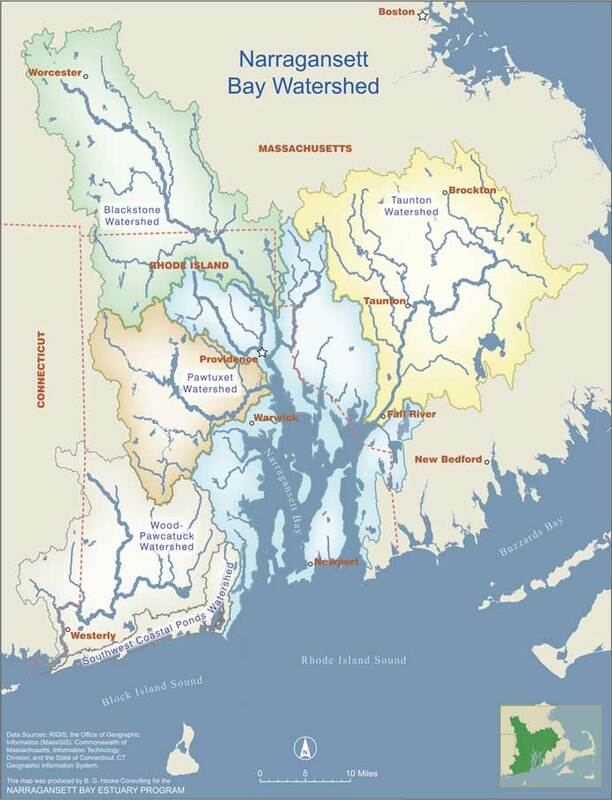 All in all, 3,578 miles of streams and rivers carry water into Narragansett Bay (see map below). The historic Slater Mill on the Blackstone River. Photo courtesy of Watershed Counts. Historically, the Blackstone, the Pawtuxet, and the Pawcatuck Rivers were epicenters for Rhode Island’s water-powered mills; however, they eventually fell out of use as power sources shifted and industry changed. 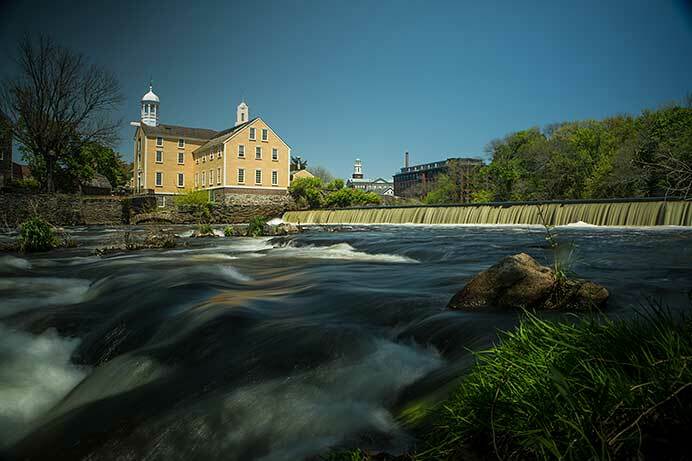 Rhode Island’s industrial legacy remains a focal point in its history, as evidenced in its cities and towns—such as Hopkins Mill in Foster—and at federally recognized historical sites—such as Slater Mill in Pawtucket as part of the Blackstone River Valley Natural Heritage Corridor. But, the benefits of these rivers are not all found in business history and industry; the big three rivers also provide channels for rainwater to flow to the coasts, habitat for fish and wildlife, and recreational opportunities such as fishing and paddling. The connection they provide between inland areas and the ocean is important to both ecosystems. On an average day, the Blackstone River carries over 500 million gallons of water to Narragansett Bay, more than the volume of 750 Olympic-sized swimming pools. This freshwater mixing with the Atlantic Ocean to the south is what makes Narragansett Bay an estuary, creating a unique environment that is saltier than the incoming freshwater rivers but less salty than the adjacent ocean waters, and is home to rich biological diversity. Some aquatic species live part of their lives in inland freshwater bodies and part of their lives in the ocean; rivers serve as a link between them and are essential to the survival of such species. At the same time, these rivers can also deliver harmful chemicals, nutrients, bacteria, and sediment from inland areas to the bay. This means that reducing pollution in the bay requires complementary pollution reduction in the rivers. Water quality monitoring data in these three major rivers are critical to tracking long-term trends in river flow and delivery of pollutants to coastal waters. Knowing the level of pollutants coming from each location can help managers prioritize clean-up efforts, thereby preserving the essential services the rivers provide to all Rhode Islanders. Map courtesy of Watershed Counts.